The Society is dedicated to the exploration of the Solar System, the search for near-Earth objects, and the search for extraterrestrial life. The society's mission is stated as: "To empower the world's citizens to advance space science and exploration". The Planetary Society is also a strong advocate for space funding and missions of exploration within NASA. They lobby Congress and engage their membership in the United States to write and call their representatives in support of NASA funding. In addition to public outreach, The Planetary Society also sponsors projects that will "seed" further exploration. Two of the highest profile programs are Lightsail and LIFE (Living Interplanetary Flight Experiment). Lightsail is a series of three solar sail experiments. LightSail-1 is expected to piggyback on a future NASA mission. In June 2005, the Society launched the Cosmos 1 craft to test the feasibility of solar sailing, but the rocket failed shortly after liftoff. LIFE was a two-part program designed to test the ability of microorganisms to survive in space. The first phase flew on STS-134, shuttle Endeavor's final flight in 2011. The second phase rode on Russia's Fobos-Grunt mission, which attempted to go to Mars' moon Phobos and back but failed to escape earth orbit. 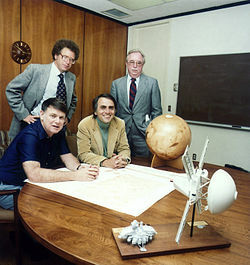 The Planetary Society was founded in 1980 by Carl Sagan, Bruce Murray, and Louis Friedman as a champion of public support of space exploration and the search for extraterrestrial life. Until the death of Carl Sagan in 1996, the Society was led by Sagan, who used his celebrity and political clout to influence the political climate of the time, including protecting SETI in 1981 from congressional cancellation. Throughout the 1980s and 1990s, the Society pushed its scientific and technologic agenda, which led to an increased interest in rover-based planetary exploration and NASA's New Horizons mission to Pluto. In addition to its political affairs, the Society has created a number of space related projects and programs. The SETI program began with Paul Horowitz's Suitcase SETI and has grown to encompass searches in radio and optical wavelengths from the northern and southern hemispheres of the Earth. SETI@home, the largest distributed computing experiment on Earth, is perhaps the Society's best-known SETI project. Other projects include the development of the Mars Microphone instrument which flew on the failed Mars Polar Lander project, as well as the LightSail-1 project, a solar sail project to determine if space travel is possible by using only sunlight. The Planetary Society is currently governed by a 12-member volunteer board of directors chosen for their passion about and knowledge of space exploration. The Board has a chairman, President, and Vice President and an Executive Committee, and normally meets twice per year to set the Society's policies and future directions. Nominations are sought and considered periodically from a variety of sources, including from members of the Board and Advisory Council, Society Members, staff, and experts in the space community. On June 7, 2010, the Society announced that famed American science educator Bill Nye would become the new executive director of the society. The Planetary Report is the quarterly internationally recognized flagship magazine of The Planetary Society, featuring articles and full-color photos to provide comprehensive coverage of discoveries on Earth and other planets. It went from bimonthly to quarterly with the June (summer solstice) 2011 issue. This magazine reaches 60,000 members of The Planetary Society all over the world, with news about planetary missions, spacefaring nations, space explorers, planetary science controversies, and the latest findings in humankind's exploration of the solar system. It will be edited beginning in September 2018 by Emily Lakdawalla, who takes over from Donna Stevens. The Planetary Society also produces Planetary Radio, a weekly 30-minute radio program and podcast hosted and produced by Mat Kaplan. The show's programming consists mostly of interviews and telephone-based conversations with scientists, engineers, project managers, artists, writers, astronauts, and many other professionals who can provide some insight or perspective into the current state of space exploration. ^ "Who we are". planetary.org. The Planetary Society. Retrieved August 26, 2016. ^ "LightSail: A Multi-Mission Project" Archived April 1, 2012, at the Wayback Machine, The Planetary Society website. Retrieved 2011-05-05. ^ "LightSail-1", The Planetary Society website. Retrieved 2011-05-05. ^ "LIFE Experiment: Shuttle & Phobos: FAQ", The Planetary Society website. Retrieved 2011-05-05. ^ "Planetary Society Welcomes Home Shuttle LIFE Passengers", press release, The Planetary Society website, June 1, 2011. Retrieved 2011-06-15. ^ "Board of Directors", The Planetary Society webpage. Retrieved 2015-05-13. ^ "Bill Nye Signs on as Planetary Society's New Executive Director" Archived November 28, 2010, at the Wayback Machine, press release, The Planetary Society website, June 7, 2010. Retrieved 2011-03-15. ^ "Projects – SETI@home – Recent updates". Planetary Society. May 26, 2009. Archived from the original on July 15, 2009. Retrieved January 23, 2010. ^ Lakdawalla, E. (2018-07-23). "Hello from the new editor of The Planetary Report". www.planetary.org/blogs. The Planetary Society. Retrieved 2018-08-08. Wikimedia Commons has media related to The Planetary Society.